Durango’s Jack Beattie launches the ball downfield against Piedra Vista’s Victor Alba and David Sabol during Tuesday’s match in Farmington. Beattie had two goals and an assist in the 7-0 win. The third-ranked Durango High School boys soccer team had an easy time scoring goals Tuesday. The Demons rolled past Piedra Vista 7-0 on Tuesday afternoon in Farmington. DHS (6-1) took a 4-0 lead into the halftime break and continued the goal parade in the second half. Lance Townsend got the Demons on the scoreboard in only the third minute, as he took a pass from Rensler Beasley and finished the goal. Beasley set up Jack Beattie for the Demons’ second goal only five minutes later, and then Beattie assisted Leland Heinicke to put Durango up 3-0 in the 13th minute. In the 18th minute, Townsend scored his second goal of the match, again with an assist from Beasley. Beattie added his second goal of the game in the 42nd minute right out of the halftime break. He was assisted by Heinecke. In the 52nd minute, Durango’s Andrew Saddler joined the scoring party. Gavin Deffenbaugh punched in the final score on a penalty kick in the 70th minute. In goal for Durango was Levi Larson. The freshman made four saves to preserve a shutout. 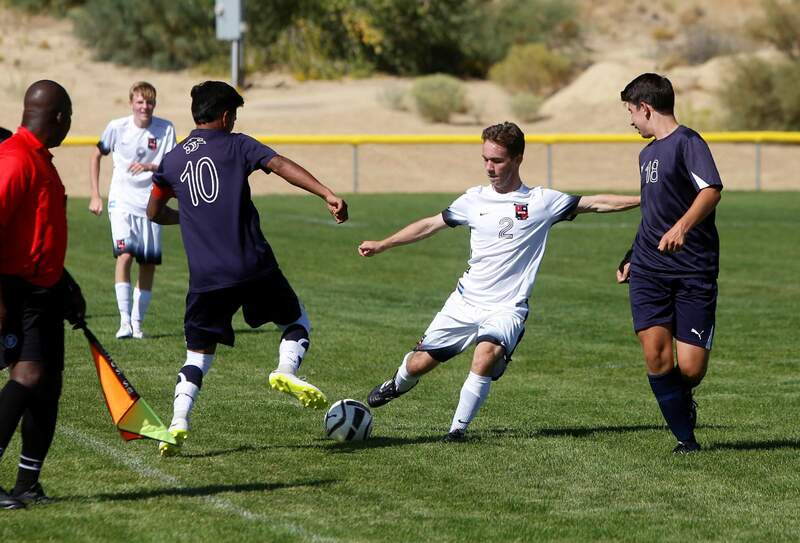 The Piedra Vista Panthers fell to 2-4-1 overall with the loss. Durango’s Lance Townsend and Piedra Vista’s Triston Charles fight for possession of the ball during Tuesday’s match in Farmington. Townsend worked through the defense to score a pair of goals. Durango will dive back into 5A/4A Southwestern League play at 2 p.m. Saturday at home against Grand Junction. 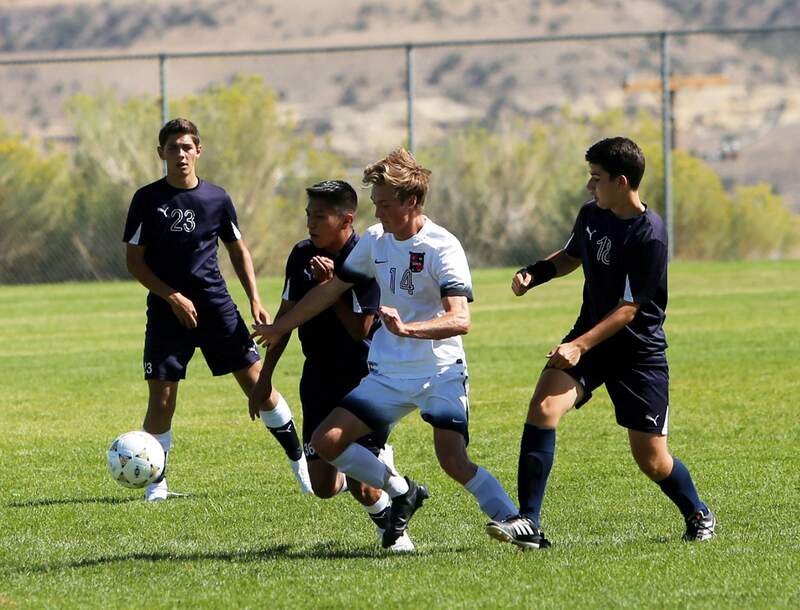 DHS is 1-0 in league play with an 11-0 win last week against Grand Junction Central. Bayfield 7, Pagosa Springs 1The first win of the season was decisive for the Wolverines. After a tough 0-4 start, the Bayfield boys soccer team pounded 3A Intermountain League rival Pagosa Springs 7-1 on Tuesday in Bayfield. Going into the match, BHS had scored only one goal all season, but that changed in a big way Tuesday. Mattia DiBello scored for BHS in the fifth minute, and he would add a second goal in the 22nd minute with an assist from Callum Marshall. DiBello would make it a hat trick with his third goal in the 34th minute, this time assisted by Jason Schneider. Schneider scored a goal of his own in the 44th minute, as he was assisted by DiBello. In the 53rd minute, Schneider scored again and was again assisted by DiBello. Pagosa Springs (0-5, 0-3 IML) answered in the 54th minute with its lone goal from captain Paul Farrah. Bayfield (1-4, 1-0 IML) answered in the 58th minute when Schneider completed his hat trick, again with an assist from DiBello. DiBello scored his fourth goal of the match in the 78th minute, assisted by none other than Schneider. Despite the lopsided score, Pagosa actually outshot the Wolverines 15-13, and each team had nine shots on goal. Bailee Blakeslee made eight saves for the Wolverines. BHS will face a tough match at 10 a.m. Saturday at home against Alamosa. VolleyballPiedra Vista 3, Durango 0The Demons will be happy not to play Farmington or Piedra Vista High School again this season. Piedra Vista (5-0) swept the Durango High School volleyball team 25-18, 25-13, 25-23 on Tuesday night in Durango. Durango is now 1-4 this season, with all four losses coming against Farmington and Piedra Vista. Vogt is excited to start the 5A/4A Southwestern League season at 1 p.m. Saturday at home against rival Montrose. Tuesday night, Taylor Wolf led DHS with five kills and three blocks. Paige Ammerman had eight assists and six digs. Millie O’Ketter also had six digs and four kills, and Kyle Rowland led the team with seven digs.